Oh darling, you look simply marvelous! Let's do the Charleston. Just take your hands like this and your feet like that and... 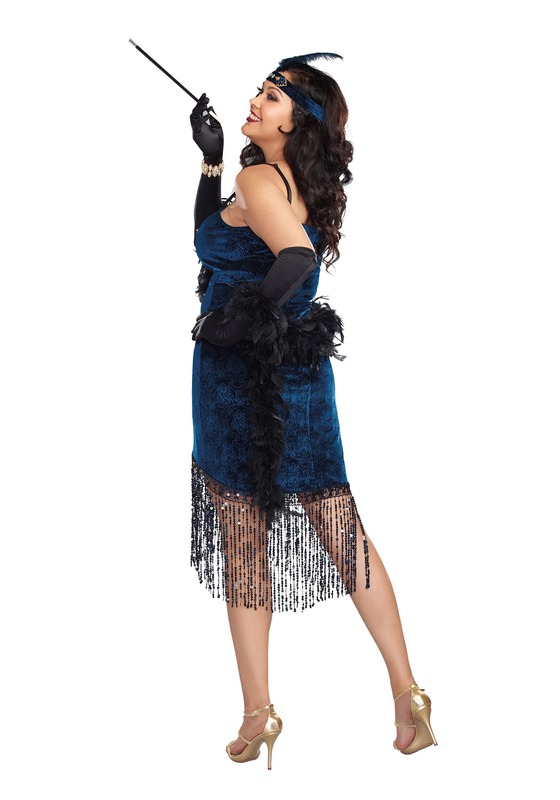 Okay, we may not know how to do the Charleston, but we do know you will be the most glamorous gal at the party with this flapper fashion. Nothing matches flapper fashion either. What other fashion gets to combine so many awesome details? Want a feather boa draped across your shoulders? Flapper will do it. Want to wear elegant elbow-high gloves? There's a flapper for that. Want a feather hairband so that you're doing some literal peacocking? This costume features a dress with a lush fabric with a subtle floral pattern. It also has Art Deco-esque jewel detailing along the neckline. The beading falls long and lush around the hem with beads and sequins. You'll love the show-stopping headpiece with jewels on the front and a plume in the middle. Just imagine the zzuzzing you'll do walking about the room. You know zzuzzing, right? You walk and the dress sounds like "zzuzz, zzuzz, zzuzz". Probably. We're terrible with onomatopoeia. Just trust us that you'll enjoy the sweet sounds of your dress twirling about and sparkling up a room. Speaking of sparks, how about flapper cigarette holders? Could they be any longer? It's like, hey lady, if you want the cigarette to be so far away from you, just don't have one! We're just kidding of course. They used those long cigarette holders in the 1920s because those boas and feathers are highly flammable. Yup. One errant hot piece of ash (we said ash) and the whole party could go up like a tinder box. No, not tinder like you use. Tinder refers to... you know what, nevermind. Go do the Charleston and have some fun. Don't forget to zzuzz!